A good quality roof that was installed correctly will last for 15 years or more if it is maintained with care. There is no way to avoid the harsh effects of the elements and the sun on the roofing materials used to construct it, but keeping it clear of organic matter and attending to minor roof repairs when needed will extend its life. Once your roof starts to age a general deterioration happens. There comes a time when you will need a total roof replacement company in VA.
How do you know when you need a new roof? The rule of thumb for a shingle roof is when over a third of the shingles are badly worn it is time to consider a roof replacement. They will appear bare and decayed. You will find an accumulation of granules in the gutters. You may see shingles with curled up edges or cracks, indicating that the adhesives used to install them are failing. Algae or mossy growth is a sign your shingles are no longer waterproof. You also need to inspect the other areas of your roof that could be showing damage that can’t be fixed with a simple repair. Do you see dark, wet spots on the ceiling or blistered paint on the walls? You may even find excess moisture in your carpet or flooring materials. Look for dampness around the windows – it could be caused by a leaky roof. Evidence of mildew and black mold in the attic shows your roof is not doing its job of keeping the house dry. On the exterior of the house, look for signs of decay in the soffits, fascia and sheathing. It tells a roofer that water has been seeping under the waterproof membrane for a dangerously long period. When the roof sags along the ridge, serious water damage has occurred. Pay attention to the cost of your energy bill. If your heating and cooling are costing you more than you expect, chances are you have trouble with the roof. When it has reached a certain degree of deterioration it can no longer act as a barrier between you and the outside elements. We understand that roof replacement is a costly endeavor, but the benefits of a watertight roof far outweigh the expense. It is an investment in your house that protects it from the weather for years to come. The new roof estimate should be presented to you using clear and concise terms that help you to understand the roofing job. Your professional roofing contractor should be prepared with a checklist to review and measure your roof, review your property and landscaping for roofing tear-off preparation and take notes about your needs and concerns. To help educate you about differences in roofing materials, the roofing professional should have actual samples of roofing materials that are part of the roofing system. You have done everything that you could to pay attention and maintain your roofs needs. 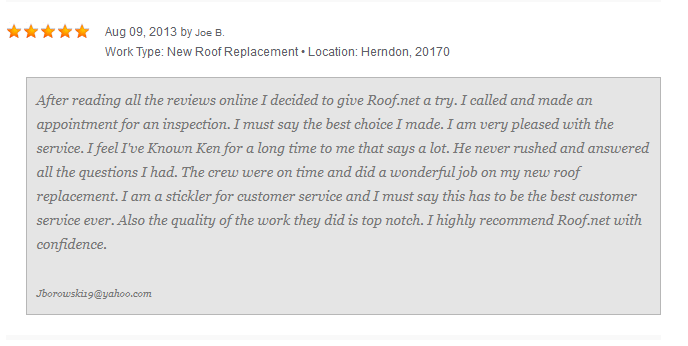 When it is time to replace your roof, your Roof.net professional will be prepared to help you through the process.